Is your office in need of a new executive desk? If yes, Mark Downs Office Furniture is here to help you pick a comfortable, highly functional, productive executive desk. An executive desk is an office desk that stands alone. It is usually rectangular in shape and made for users to work with documents. It is considered a high quality desk because it is built like a fine piece of furniture. A common feature of an executive desk is a pedestal (file cabinet) under the desk or on both sides of the desk. You may also have a keyboard drawer as well. Read, write, and work on your computer or file documents at your executive desk. You can do it all and not sacrifice comfort. Need an executive desk today? 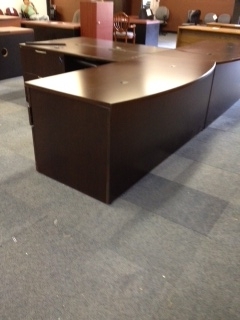 Purchase the Deluxe Reff Bow Front Executive El Desk (image below) from Mark Downs Furniture. This entry was posted on Friday, July 13th, 2012 at 7:56 pm. Both comments and pings are currently closed.